French import Big Blue has caused an Everest day upset with his win in the St Leger Stakes. 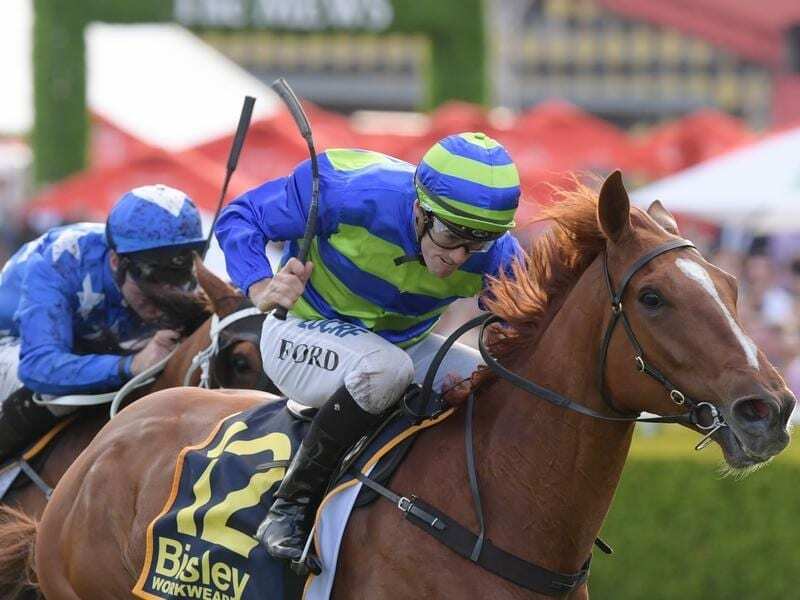 Melbourne trainers Ciaron Maher and David Eustace have continued to make their mark on Sydney racing with Big Blue winning the $500,000 St Leger off the back of two hurdle wins in country Victoria. The training partnership has now had a winner at the past three Sydney meetings with Dubious claiming the Breeders’ Plate on September 29 and Yulong January winning a week later. Stable representative Annabel Neasham was skeptical about Big Blue coming to Randwick but bowed to Maher’s judgment after $31 chance led most of the way to beat One Foot In Heaven ($6) by 1-1/4 lengths with Red Cardinal ($11) another 2-3/4 lengths third. “He must be the first horse to come to Randwick and win off the back of two hurdle wins,” Neasham said. “It was really good planning by Ciaron. I thought he was joking when he said we are coming up here. Big Blue was originally trained by Andrew Fabre in France before being imported to Australia by Godolphin. He is now co-owned by long-time Maher clients Col and Denise McKenna. “He has a great ownership group,”Neasham said. His jockey Jay Ford was buoyed by Big Blue’s wet track form. “When I looked at his form, saw he loved the wet ground and would stay all day and when the heavens opened like they did I really started to warm to his chances,” Ford said. “We rode him to his strengths, gave him a nice bowling ride out in front and kept increasing the tempo from the 1000 metres. One Foot In Heaven has also made his way to Australia via France where he was trained by Alain du Royer-Dupre. “To be fair if I stayed on the fence he probably wins, but he forced my hand to come out because he was going too keen from the half mile,” jockey Tommy Berry said.